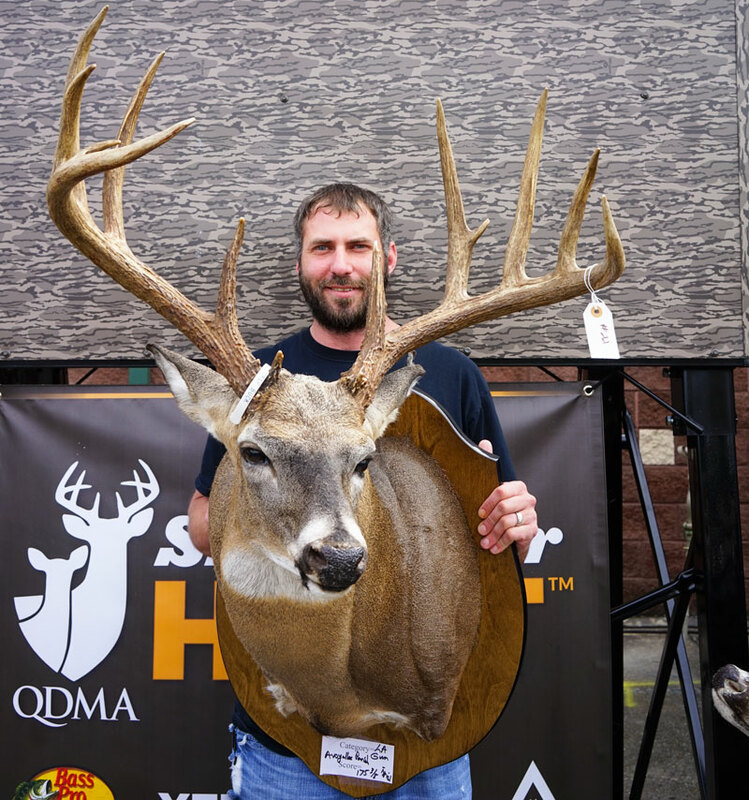 Many impressive racks were scored at the show – but a few stood out. There are so many ways to spend your oohs and aahs at the annual Louisiana Sportsman Show and Festival – big and small boats, that special bucket-list hunt or fishing vacation, tractors for every need, those must-have hunting equipment and fishing tackle to outfit any trip from a peaceful, backwaters bream float to a take-your-breath-away bluewater adventure. 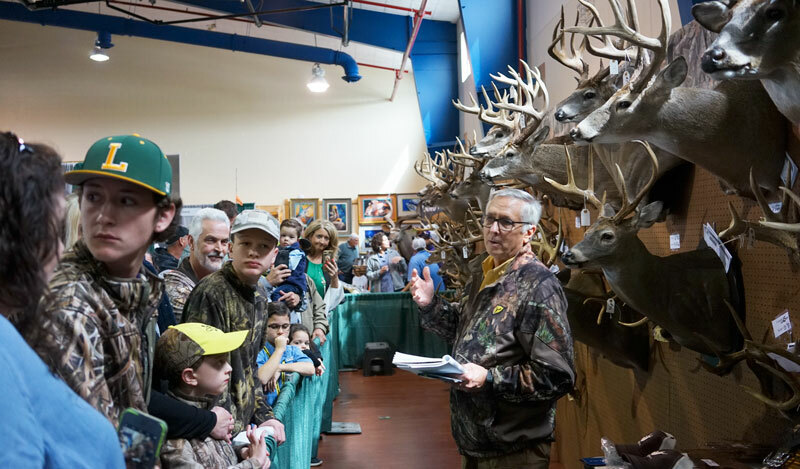 But when it came to oohing and aahing, it seemed thousands among the thousands at this year’s show saved most of them for The Wall – the giant racks of antlers hunters brought to the show’s Big Buck Contest. Contest head honcho David Moreland answered each “where did that one come from” and “what did that one score” question. Moreland’s name (if not his face) is recognized by most Louisiana hunters for his decades dedicated to the state’s whitetail deer, first as a wildlife biologist, then as State Deer Study leader, then, in his last year before retirement, the top man in Louisiana’s Wildlife and Fisheries’ Wildlife Division. During the show’s four-day run, the first set of horns they saw belonged to former Louisiana State Senator Joe McPherson, the Alexandria man currently serving on the Louisiana Wildlfie and Fisheries Commission. 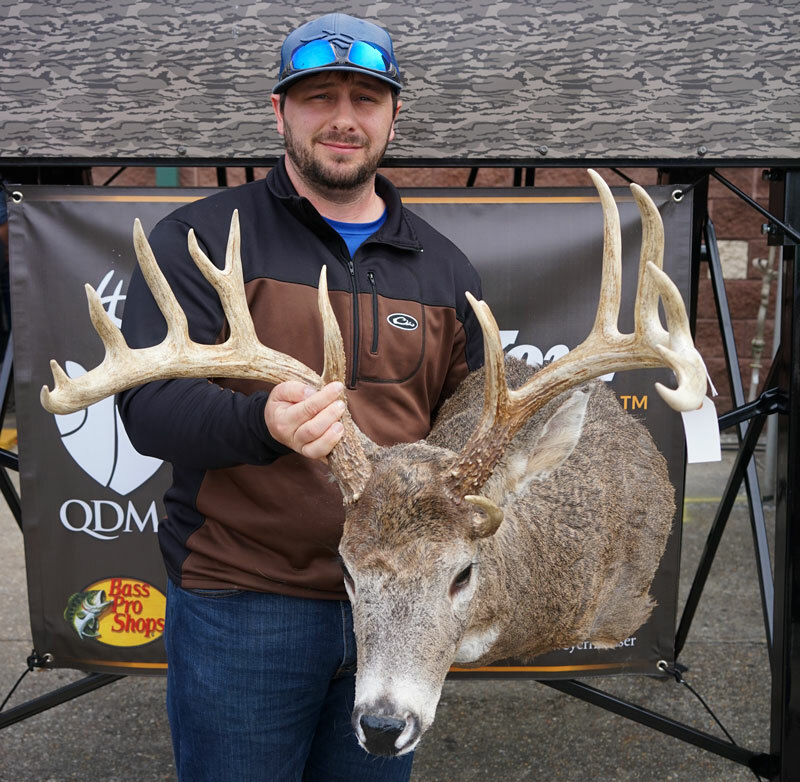 McPherson’s been talking about that buck for months, and he’s relived that hunt in Avoyelles Parish many times and always with a smile on his face knowing he’s waited for a long, long time for a chance to see antlers like the one he saw, and took, that day. Deservedly so. As it turned out, his take-your-breath-away trophy measured out – by Moreland’s hand and tape measure – to stand as top entry and win the top prize. Louisiana Division-Gun: Joe McPherson, Alexandria, 175 3/8 (typical), Avoyelles Parish. 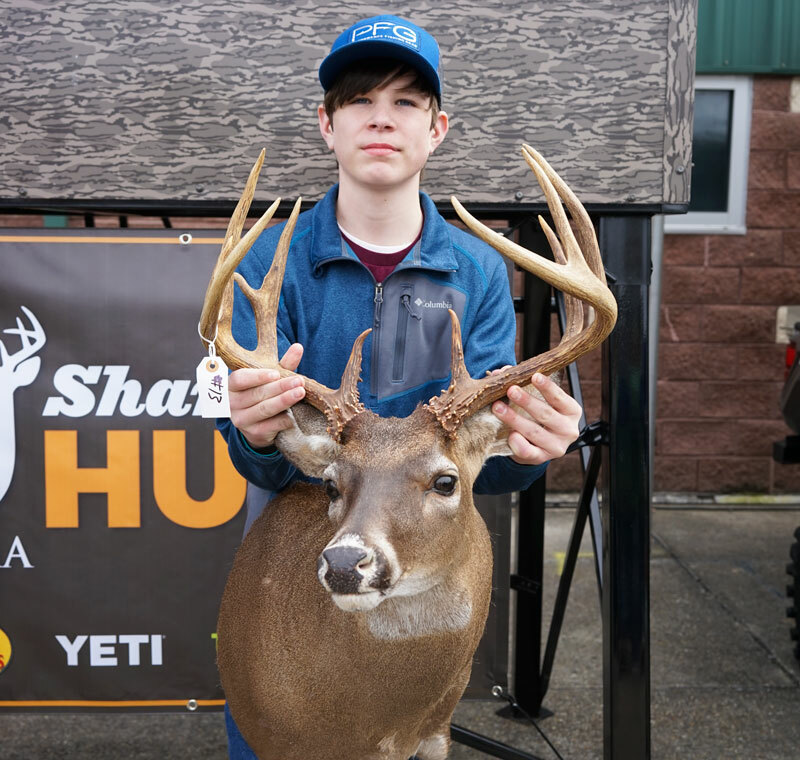 Here his son poses with the winning buck. 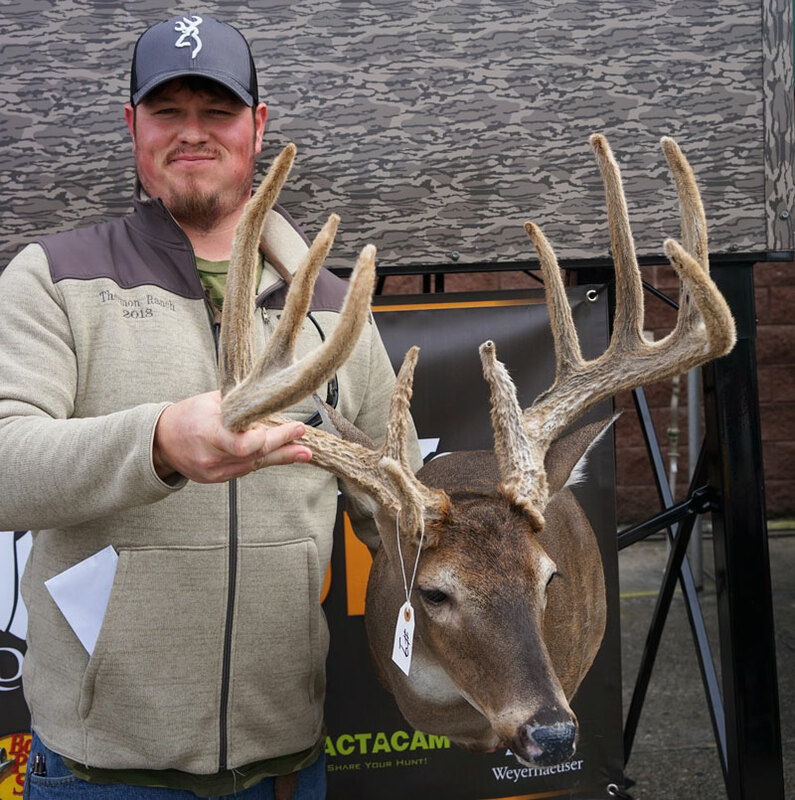 Moreland said the 175 3/8 score more than qualified McPherson for the Boone & Crockett book (for whitetails taken with a modern firearm), a list reserved for only the highest scoring antlers. 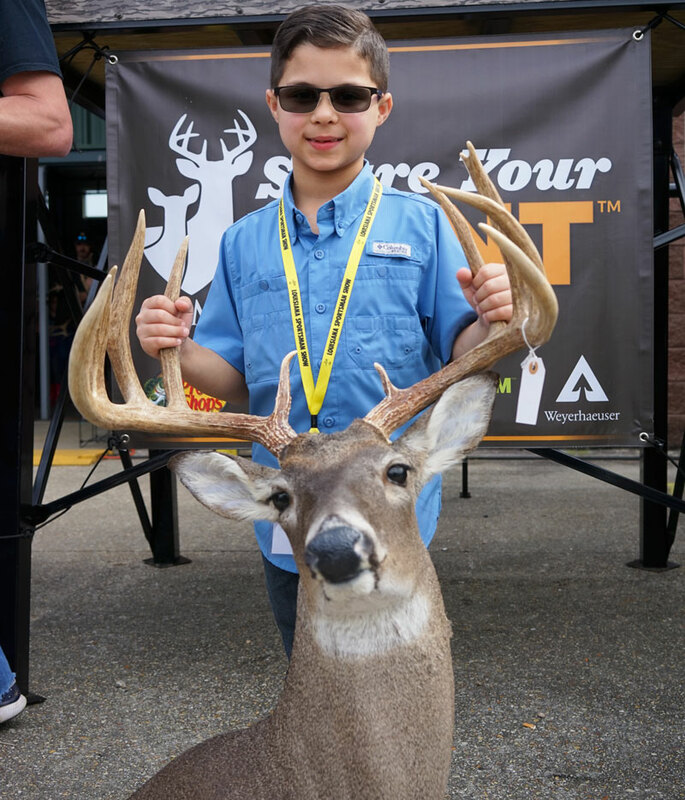 The oohs and aahs didn’t stop there: Consider 7-year-old Jacques Callais drawing down on a big Texas buck with a crossbow – a crossbow! – and dropping a 143 4/8 scored deer. It was easy to see the youngster from Galliano a winner in the Youth Division. Youth Division: Jacques Callais, Galliano, 143 4/8 (typical), Dimmit County, Texas. OK, so that was the old and young of it, but there was more. How about Alysha Alise standing tall for Louisiana’s women in the outdoors. 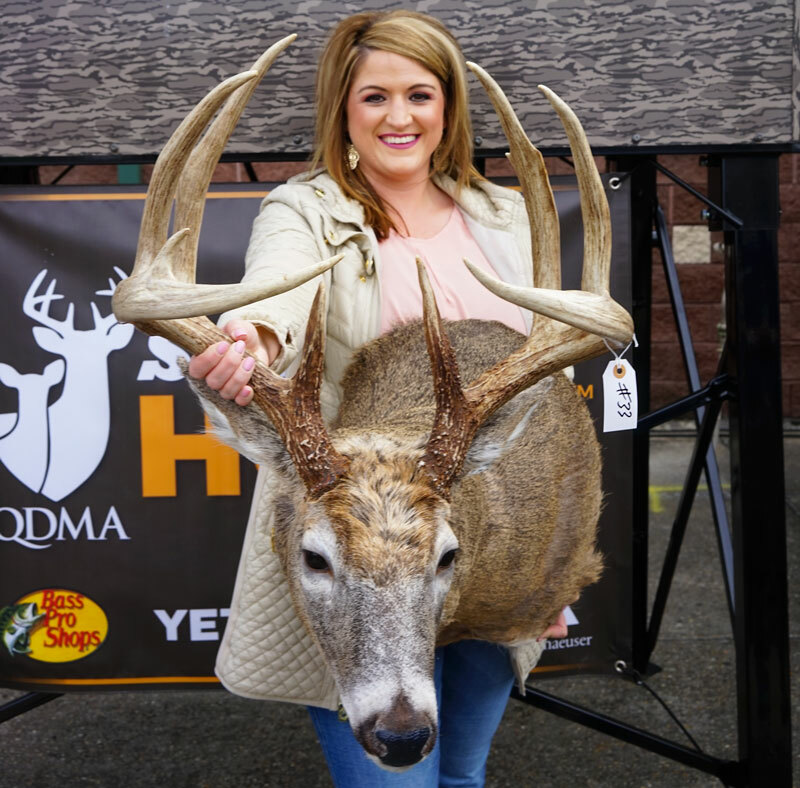 The French Settlement huntress ventured to Missouri and took a 164 scored whitetail to win the Out-of-State Gun Division. Out-of-State Gun Division: Alysha Alise, French Settlement, 164 (typical), Missouri. 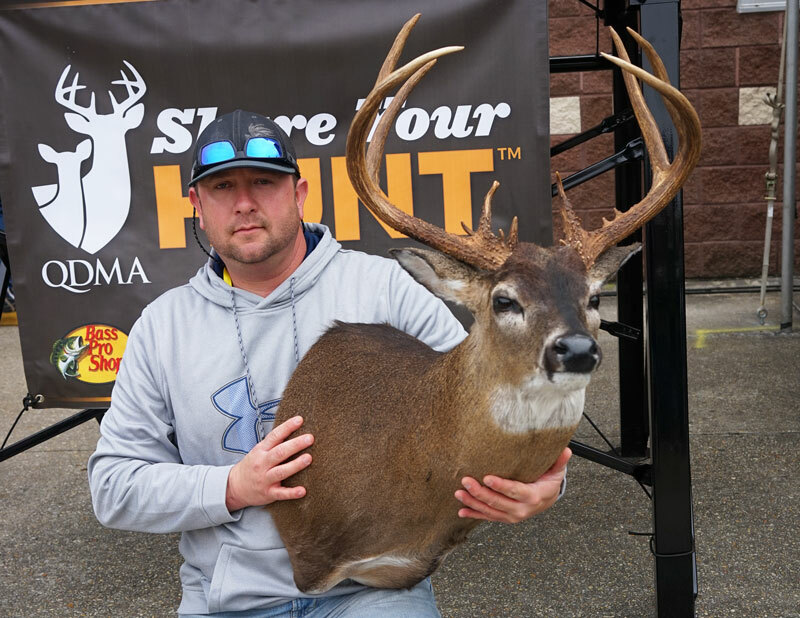 That Alise’s entry, like that of Out-of-State Bow Division winner Troy Laborde – his came from Missouri, too – didn’t outscore the Louisiana entries shows what Moreland has known for years about the Sportsman’s Paradise bucks. Out-of-State Bow Division: Troy Laborde, Port Allen, 155 4/8 (typical), Missouri. Moreland said there were several scored antlers from deer taken in the agriculture fields (McPherson’s was one) and another good mast crop and abundant rains this spring. “We’re seeing a green-up in the woods early this year and that means good food sources for the state’s deer herds,” Moreland said. “There’s every reason to believe there will be good growth and antler development next season. Moreland had help scoring from two old wildlife biologist friends, Scott Durham and Tony Vidrine “…because it helps having another pair of eyes when you’re scoring,” Moreland said, there was a segment of the hunting community he wishes would venture to Gonzales and the Lamar Dixon Expo Center for future contests. Oh, and the last ooh and aah came from the crowd when passing one of the last trophies hanging on the contest’s wall: Anthony Alford’s trip to the mile-after-mile of grain fields in Kansas produced the only nontypical winner. 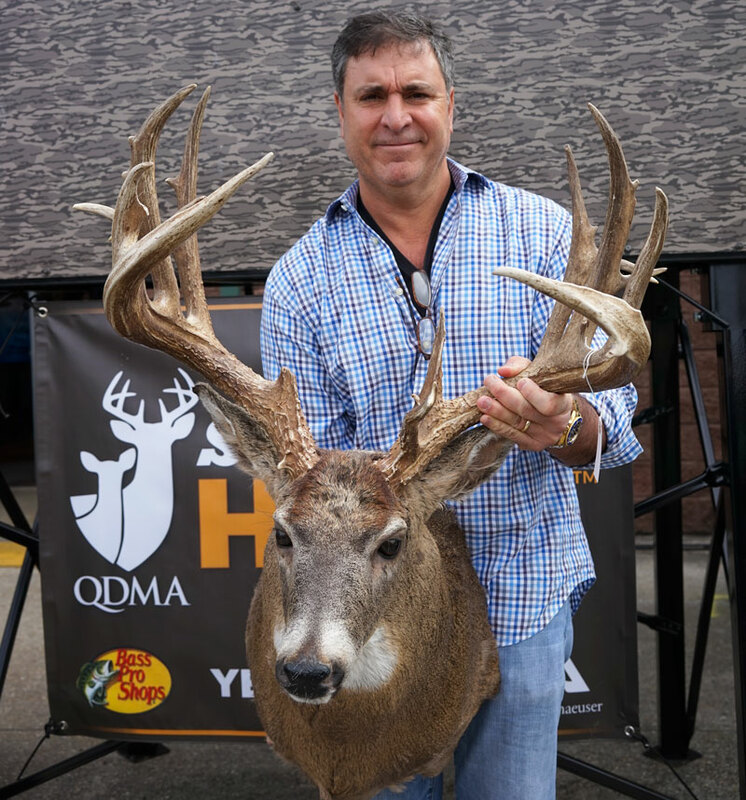 The Houma hunter won the Muzzleloader/Crossbow Division with an antler spread scoring 199 4/8. Muzzleloader/Crossbow Division: Anthony Alford, Houma, 199 4/8 (nontypical), Kansas. Other top spots went to Branson Trawick, Nick Louque and David Everett. Mississippi Division-Gun: Branson Trawick, Holden, 132 6/8 (typical), Franklin County, Mississippi. Mississippi Division-Bow: Nick Louque, Paulina, 141 5/8 (typical), Adama County, Mississippi. Louisiana Division-Bow: David Everett, Denham Springs, 162 1/8 (typical), Concordia Parish. Lord willing, there will be a 2020 Big Buck Contest, and hunters are advised to hold their antlers from this year, and hunt hard during next season, and bring your trophies. 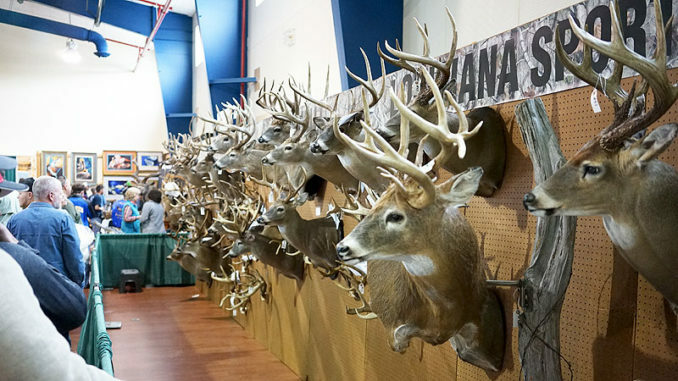 Make sure to use one of those LDWF-issued tags when you do – next March at the Lamar Dixon Expo Center.